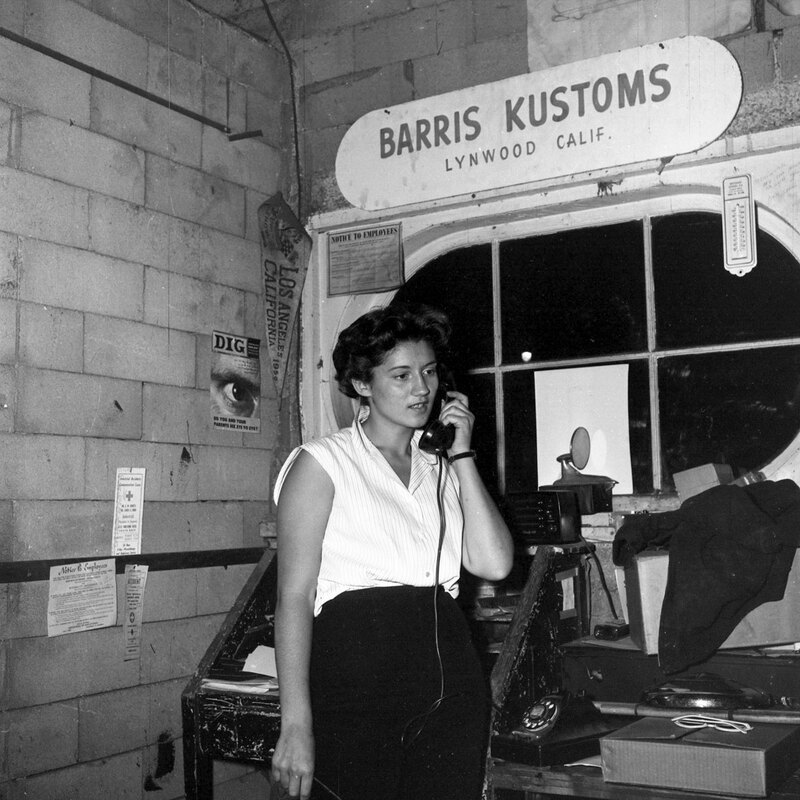 Spence Murray Took a photo in the early 1950’s of a corner at the Barris Shop that has intrigued me ever since. 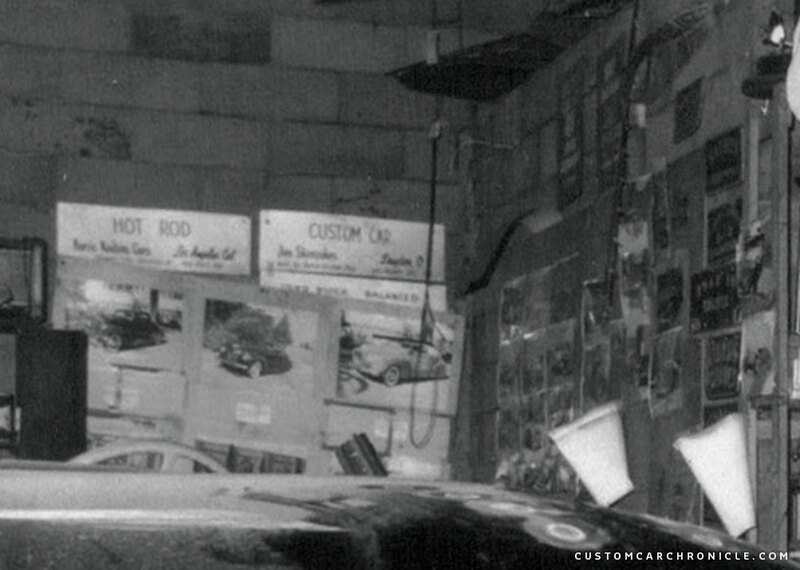 Its time to do some heavy Custom Car Archeology to find out what the Barris guys displayed on this Shop Wall. When I saw The Barris Story by Spencer Murray in the May 1953 issue of Hop Up magazine for the first time, there was one photo that intrigued me more than all the other photo’s in the article. 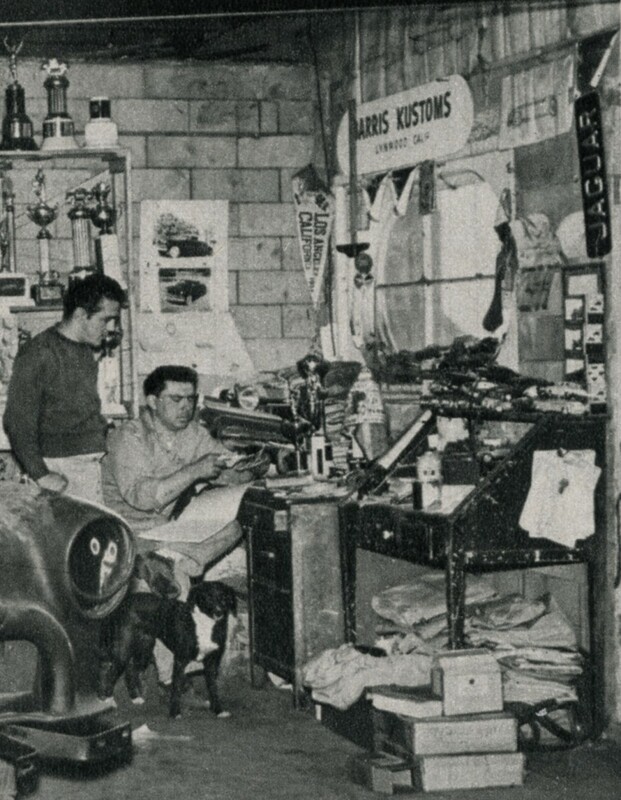 The whole article is absolutely great, and the photos shown are fabulous, but this one photo show Sam Barris with his brother George Barris behind a desk in a corner of the Barris Atlantic Avenue Shop. Why did this photo intrigued me so much? I have always been a great fan of the custom creations from the Barris shop, especialy from the early days, late 1940’s and early 1950 and this particular photo is from that era. Usually we see photos of the cars, or perhaps from the guys working on the cars. But we rarely see the things that inspire the great customizers to build the custom cars we have admired since they were built. This photo was the first time I had a close look at the Barris Shop corner with all kinds of goodies displayed on the wall of this corner in the Barris Shop. Material that George and Sam, or perhaps somebody else in the shop thought would be nice to display on the wall for others to see. 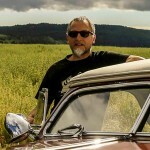 Photos of Customs that had been built by the Barris Shop, possibly to inspire future customers, trophies that were won with the cars build at the shop. All kind of material that must have been put there to motivate the guys at the shop, to inspire them to create more and better cars. Or just to remember them how popular the Barris Kustom Creations already were as could be seen in the many magazine publications even in the early 1950’s. 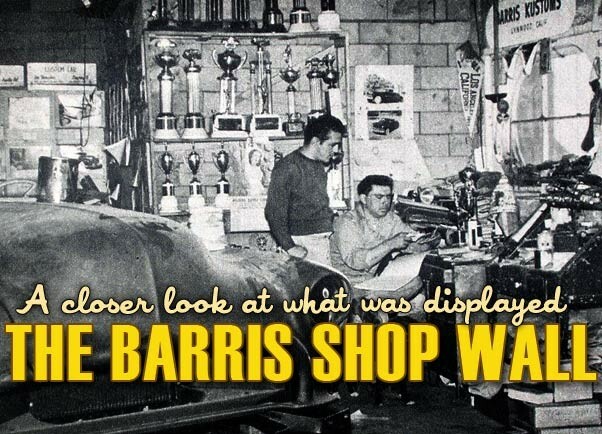 Since I first saw this picture (Photo 1), I have been saving every photo I could find of this part of the Barris shop, taken in the early 1950’s, hoping to find more information to figure out what was on those walls. There is still quite a bit of material I can see that I’m unable to identify during my Custom Car Archeology search trip. Perhaps this article will lead to some unseen photos, or perhaps somebody else will be abel to recognize the things I have missed. 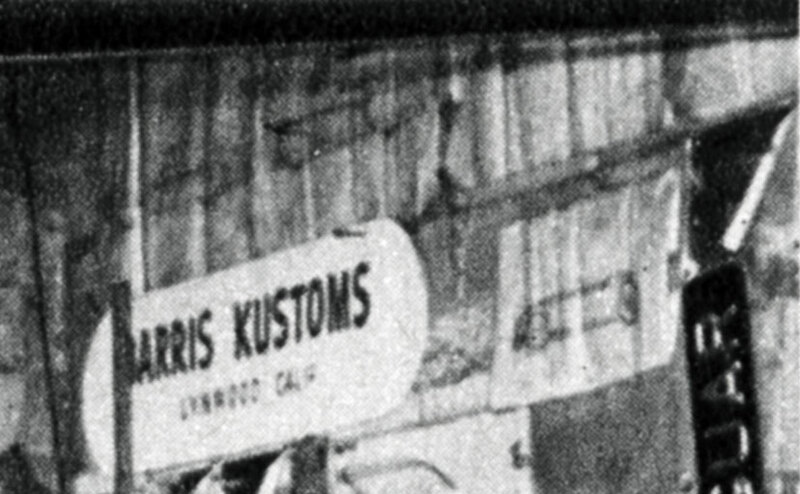 This is the photo from the Hop Up Magazine that started my hunt to find more photos showing this part of the Barris Shop, to find out what inspired George, Sam and the others at the shop. The photo was most likely taken by Spencer Murray who wrote the story and was taken either in late 1952, or early 1953. 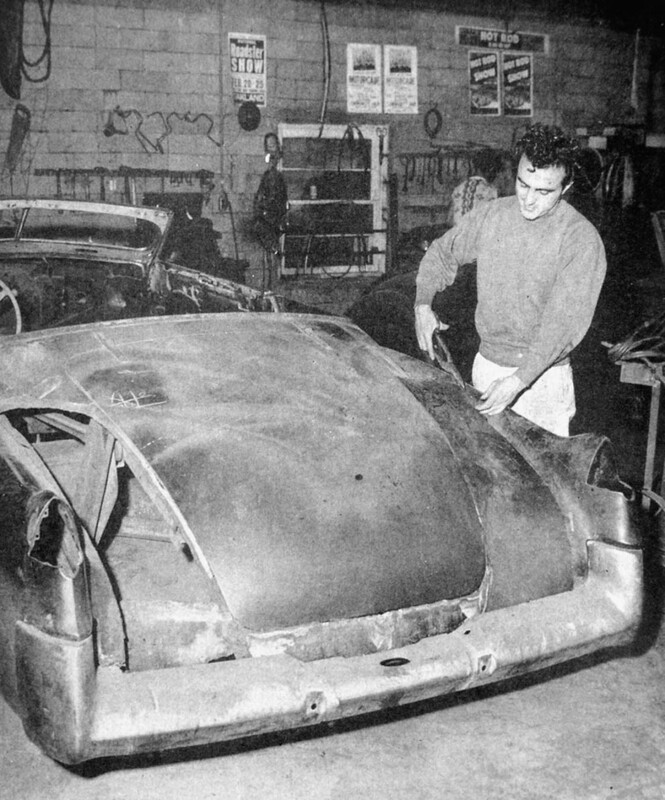 The car in the picture is the 1952 Olsmobile of Jack Nethercutt. This corner of the shop is in front of the building, towards the Atlantic Blvd. The wall behind the trophy case is a storage room which can only be accessed from the outside. The walls from this storage space are not all the way to the top, so it also severs as an “attic” to store even more stuff at. 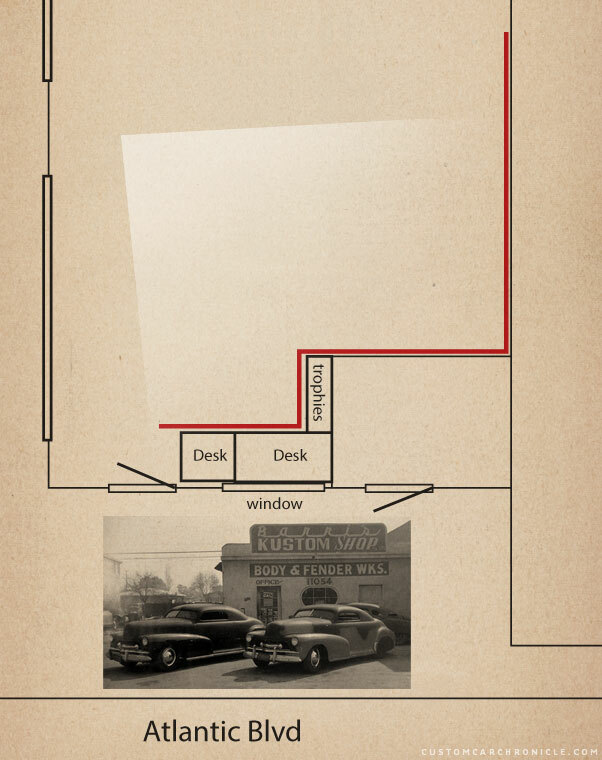 This illustration shows where the photos were taken in the Barris Shop. At the front of the show there is a door into the shop, next to it the window with the round corners and then there is the storage space which can only be accessed from the outside door. The white pyramid shape inside shows the point from where the photos were taken. The drawing is NOT to scale. 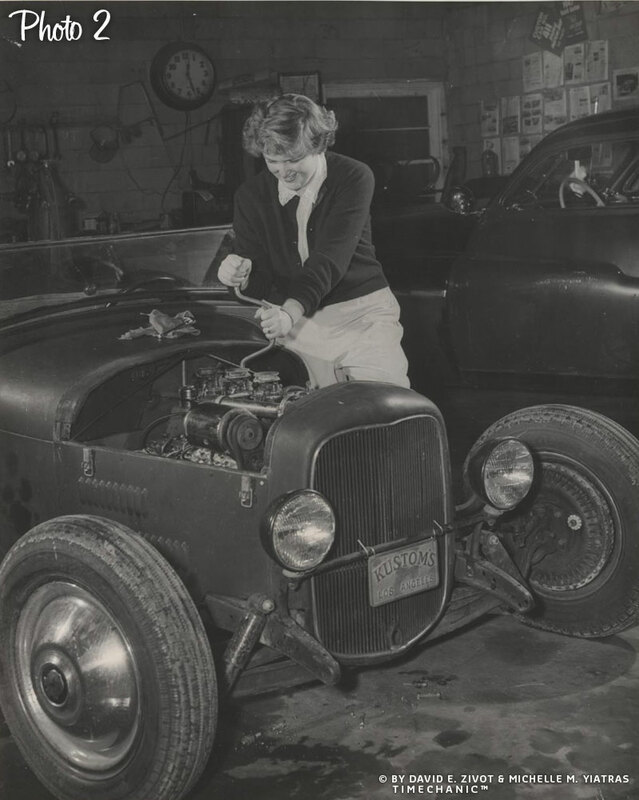 Photo number 2 is from the Marcia Campbell collection and shows Marcia Campbell in a staged photo wrenching on his model A Hot Rod. 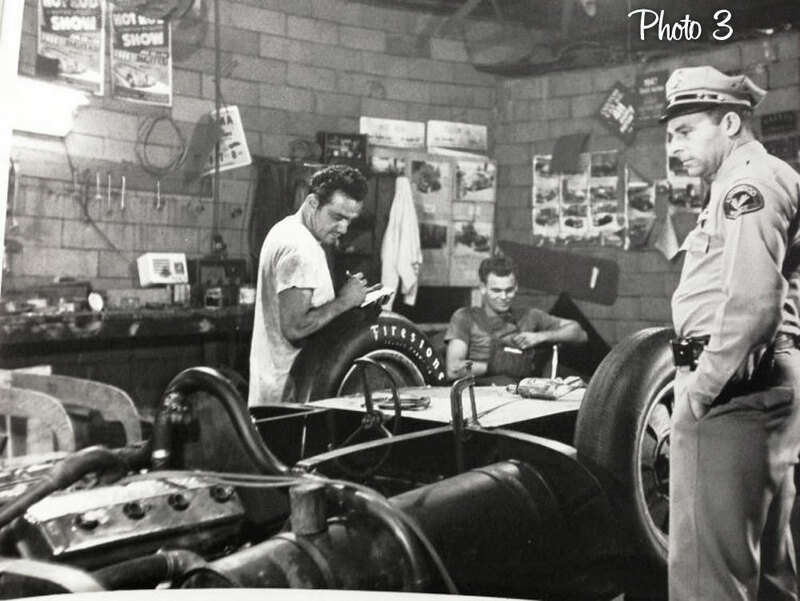 This photo was taken in late 1950 at the Barris Shop and gives a nice look at the Shop Wall in the background and how Barris had posted some magazine articles on the wall. We can also see a two show signs from the 1950 Oakland Roadster show and a big clock on the back wall. Road & Track May 1948 article on George his personal 1941 Buick. The two had painted signs/cards hanging from the wall are from the 1950 Oakland Roadster Show. Obviously two of the barris Kustom Shop creations that were shown at this historic Hot Rod and Custom Car show. One of the is for the car with number 411, so far we have not been able to find out for which car this number was for. The 1950 Oakland Roadster Show program does not list all the cars at the show, and the 411 numbered car is amongst those not listed. But the cars on the top right is most likely the one made for the 1947 Buick of Ben Mario, which is listed as the 211 car in the program. Since the two signs are together it could of course be possible that the 211 number in the program, which was printed ahead of the car show, was later at the actual car show changed into 411 for unknown reasons, but we are not sure about this. 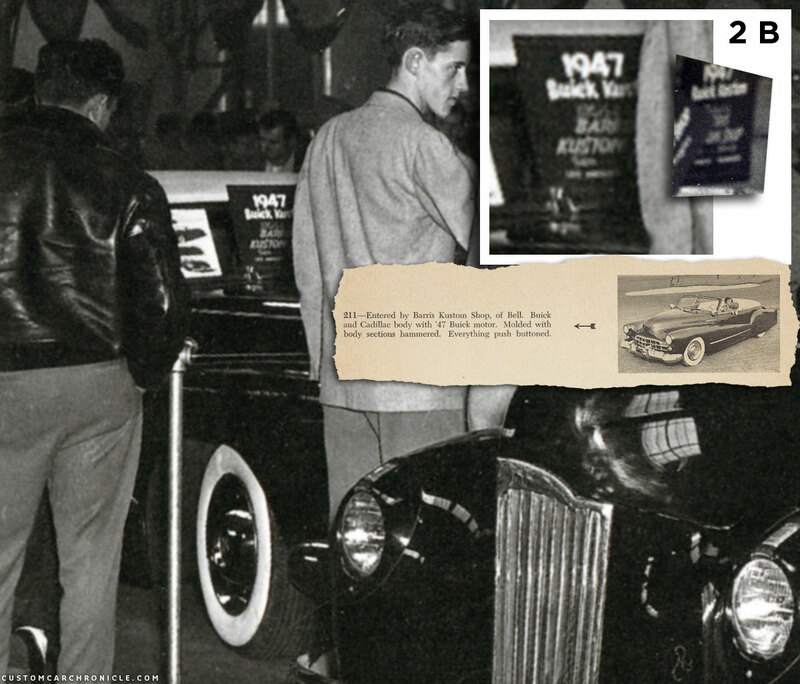 Here we can see two posters of as far as I can tell from the 1951 Hot Rod and Motor Sport Show held at the Los Angeles National Guard Armory. At this show a Jaguar XK-120 was given away at a lucky person from the public. I could not find an good image of the actual poster hanging from the shop wall, but the This was the show that the Jack Stewart 1941 Ford debuted. Section D shows a board nailed to the corner of the back wall. 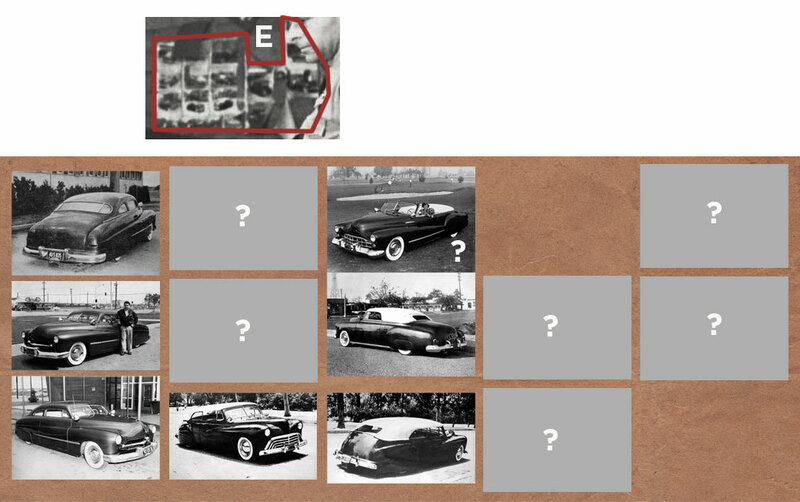 The 6 photo’s placed on the board we have been able to identify, we are not sure what the small cards are underneath the photo’s But possibly this is a display board that was taken to early car shows that showed some of the Barris Customs. And the cards are a short description of the cars. The two cards at the top of this board are possibly Car show display cards as well. But so far we have not been able to identify from which show the Hot Rod and Custom Car display cards might have come from, nor to which car they belonged. In none of the photos we have so far we can actually read what is on these signs. In a few other photos this part D shows even better so we have included those in the image below. The cars on this Display board are all from the late 1940’s. From left to right: unknown 1934 Ford chopped coupe, Johnny Zaro 1940 Mercury, Unknown 1941 Ford convertible with padded top, Jesse Lopez 1941 Ford, Al Andril 1940 Ford, Var Martin 1941 Buick Coupe. Section E on the wall looks to be a selection of photos of some of the Barris Kustoms created cars that where photographed by Marcia Campbell. At least most of the photos we have been able to identify were taken by Marcia, and we know that Marcia always gave away the photos. So perhaps this was the place where George and Sam pinned these photos to the wall. We have also noticed that this section changed quite a bit over time. 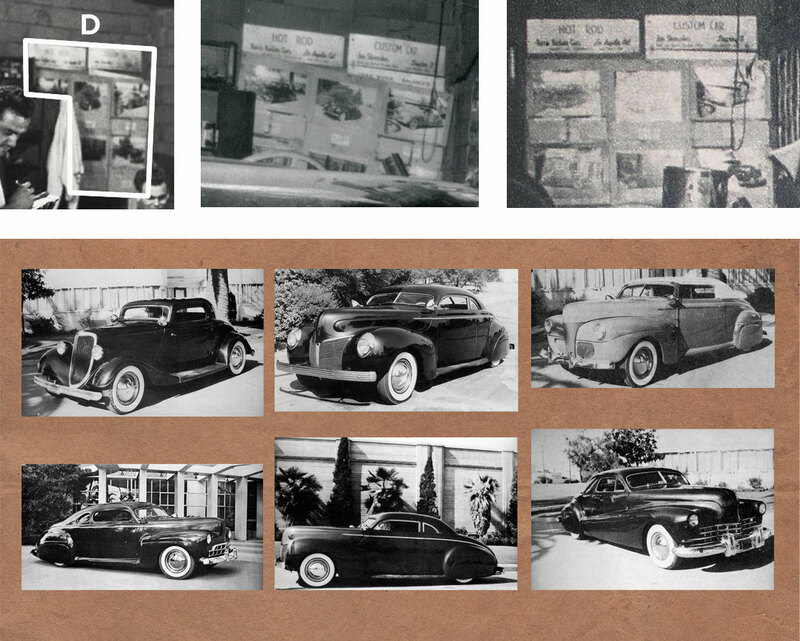 The photos we have been able to identify in this set are the three on the left which are of the Sam Barris 1949 Mercury, the two on the bottom in the middle which is the Joe Urritta 1941 Ford, and one photo of Carl Abajian’s 1949 Chevy, and possibly one photo of Ben Mario’s 1947 Buick, but the last one is not sure. This looks to be another poster, so far I have not been able to identify this item. In photo number 2 we can see only a small corner of this poster and it looks like the top word ends with the letter “MA” which could be Motorama, or Autorama. But so far I have not been able to find anything that looks anything similar to these images. Another Custom Car show card. We can read the “CUSTOM DIVISION” and “ENTRY No A-14. the “contestant is a small ribbon hanging from the shelves and does not seam to be part of the show card. The image below shows the same sign cropped from two different photo, and in one we can read the owners name a little better. This card could read “Don Vaughn” most likely for his 1947 Buick convertible. The lower line on the car most likely reads “KUSTOMS OF LOS ANGELES”. SO far I have not been able to find out from which particular show this car is from. 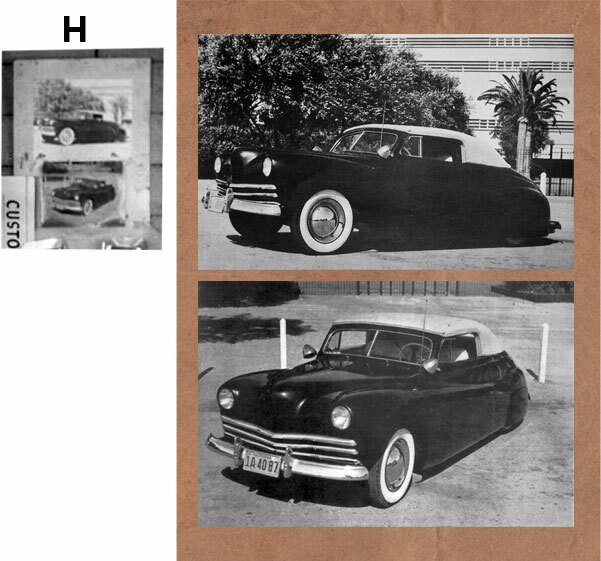 Section H on this photo shows two photos of the Johnny Zaro 1941 Ford that was originally created for John Vara, but bought by Johnny before it was finished. Both photos show the car in its early version with the first version grille and smooth moon disk hubcaps. 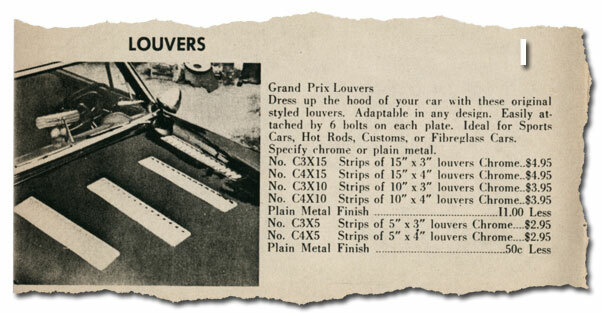 Hanging below the Johnny Zaro 1941 Ford photos are a few samples of a Barris Kustoms Product called “Grand Prix Louvers. This was a product the Barris Kustom Shop sold thru their mail order business. Lows of chrome plated or bare metal louvres that people could mount on their cars, or weld in existing panels. 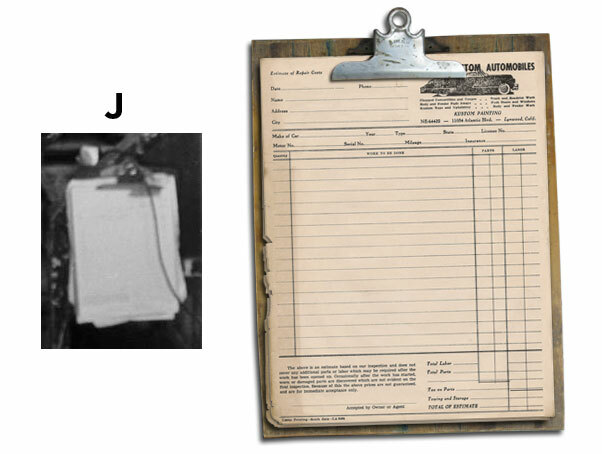 Hanging from the side of the Desk is a clipboard with the Barris Order Form /Invoice paper with George Barris his personal 1942 Cadillac image on the top right corner. Possibly this clipboard contained all the order forms from the cars that were in the shop at the moment. And the Barris Shop employees could see what needed to be done on the project they were assigned to. This photo of the secretary, desk, part of the wall and front window is actually an older photo than the photos we have seen previously in this article. The wall and the desk are a lot cleaner, indicating that this photo must have been taking not all that long after the Barrises moved into the Atlantic Blvd shop. On the wall on the right there are a few what appear to be newspaper or magazine clippings about medical issues. a Dig magazine cover. The Barris Kustoms Lynwood Calif. board with the round ends is most likely something left over from an early indoor car show. So far we have not been able to find out where it was used, but we do know that it stayed in that same position for quite some time. This early photo also shows that the two separate desks are in a different order now, than in the article lead photo where the small desk which is now in the corner is located on the outside. This is the felt pennant hanging in the corner rotated to have a better look. Mick Ellis identified the felt pennant from 1950 hanging in the corner of the shop. 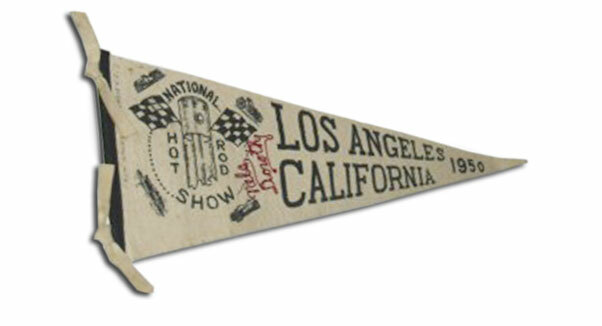 He send us a picture of the 1950 Los Angeles Hot Rod Show felt pennant from his personal collection. Thanks Mick. 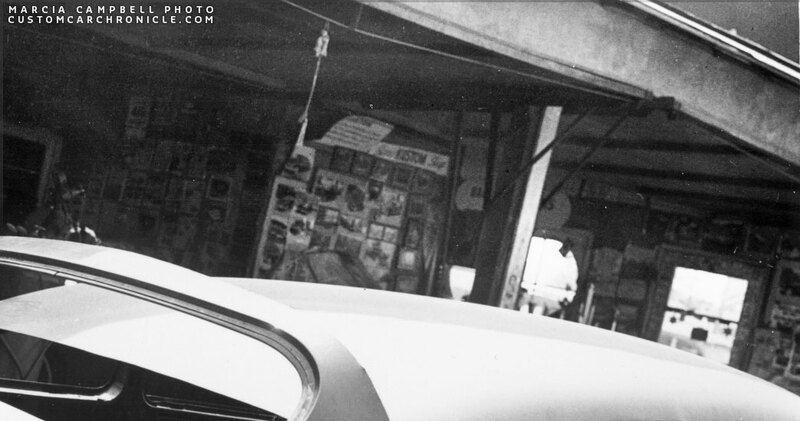 George Barris working on adding a set of Cadillac rear fenders to a Buick convertible. This photo gives us a look at the back wall towards the corner. Lower on the wall there are all kinds of tools hanging from hooks in the wall. On the left is a 1951 Oakland roadster show poster, the two in the center I have no idea, it appears to read Motorcade, but so far I have not been able to identify it. 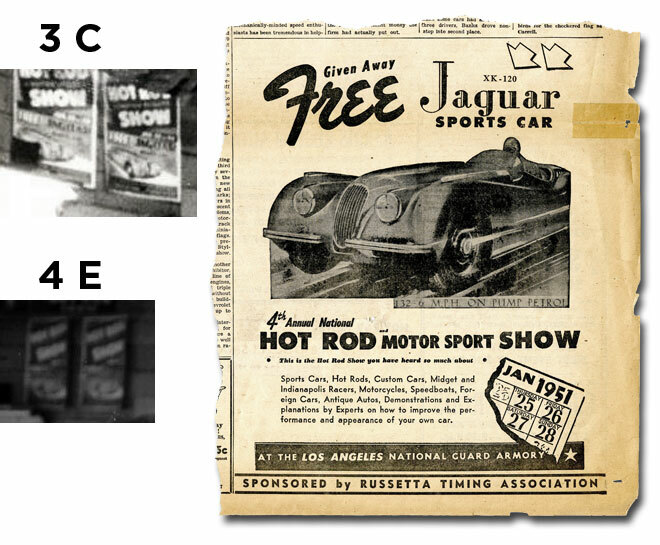 The two poster on the right are from the 1951 Hot Rod and motor Sport Show which have been mentioned in the previous photos. The Hot Rod Show banner is another item we are not sure of where it comes from. 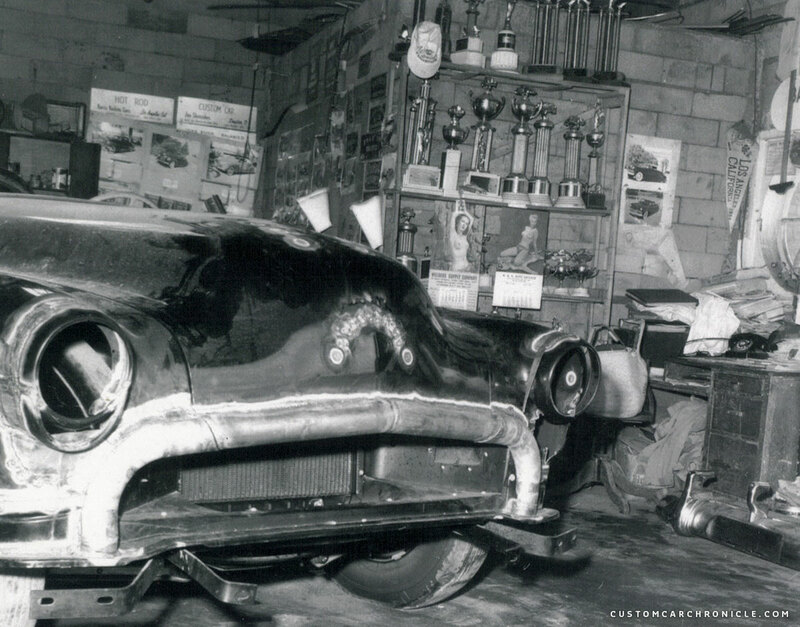 Another photo of the shop shows the work on Jack Nethercutt’s Oldsmobile progressing. The grille surround has been roughed in, and the new very clever headlight design was roughed in on the passenger side and not yet started on the drivers side. The wall shows nothing new, only from a different perspective. And we can see that the back wall of the storage space also has what looks like a couple of car club plaques on it. 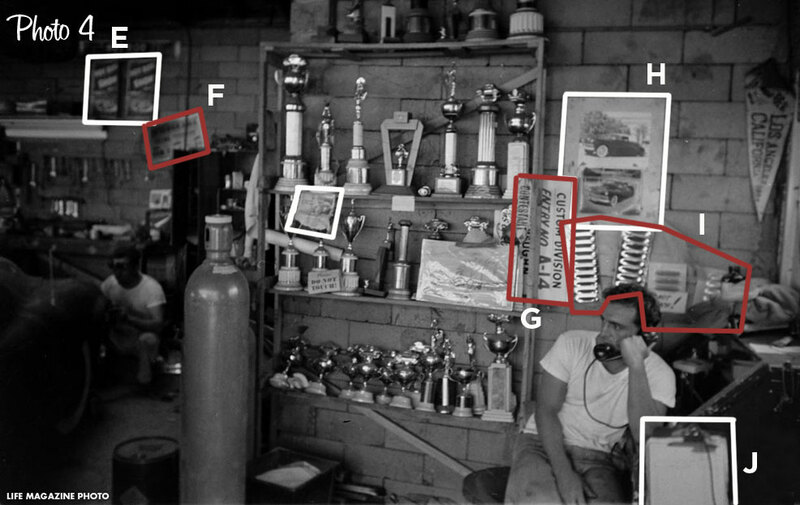 Enlarged section of the wall shows the Custom Car photos in the background really well, but does not really give much info on the photos on the side (back of the storage room). From the plaques on the right I can only identify the top right one which is an Kustoms of Los Angeles Plaque. And David E. Zivot identified a second one. A very early Los Angeles Car Club called Century Los Angeles. Kustoms of Los Angeles and Century Los Angeles plaques. The photo below is a enlarged section of the openings photo. It shows the kind of messy desks filled with all kinds of stuff including trophies papers and on the right side a series of model cars. We know that George uses model cars, possibly Promo models he got from the car dealers, to show his clients what he had in mind for customizing and paint colors. On the top it seams like there are a series of drawings/sketches pinned to the wall. Sadly there is no photo showing section any better. Would be very interesting to see these a little better. What we can also see is a large Jaguar script European size license plate. George and Sam are most likely posing for the photo, not sure what Sam is holding. I’m also not sure who the shop dog is, below Sam’s feet. Enlarged section shows the design sketches high on the front wall of the building. Sadly the photo is to grainy and dark to really make out what is on the illustrations. These two photos from the Life Magazine photo-shoot are a bit funny. 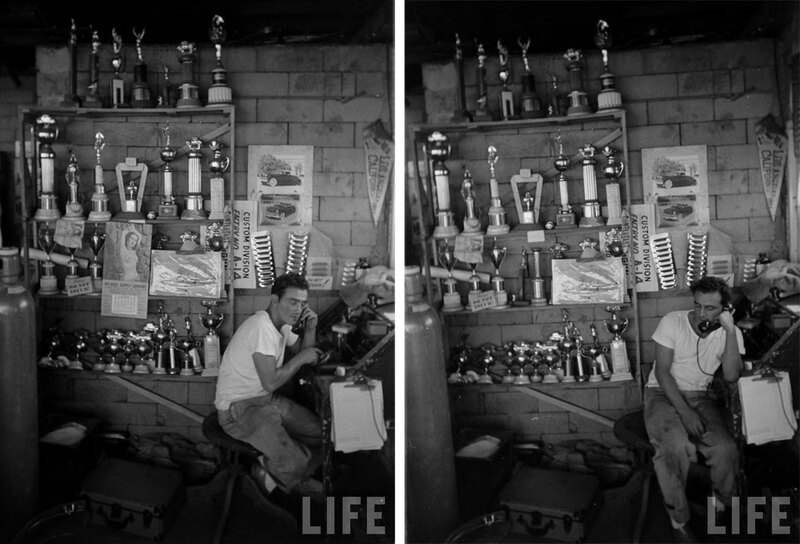 On the photo on the left where George Barris is dialing a number on the telephone the case with trophies shows a nudie calendar in the middle, and when George is “talking” to somebody on the phone in the photo on the right the calendar has been removed! 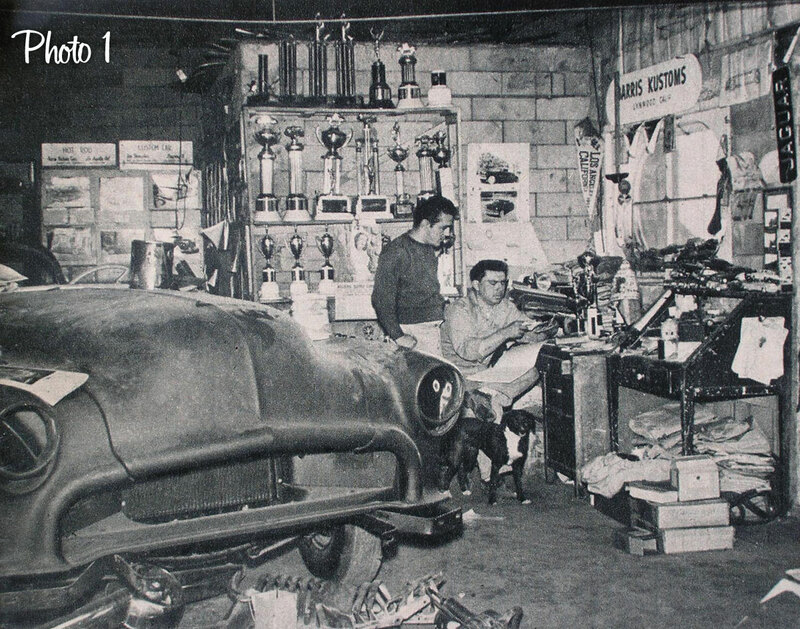 Upon closer inspection of some of the Marcia Campbell photos of Sam Barris and Jerry Quesnel chopping the top on Jerry’s 1949 Mercury we found one photo that showed this section of the shop in 1951. Apparently the (trophy) shelf had not been put up against the wall in front of the shop yet. A lot of photos, possibly a lot of them taken by Marcia Campbell, had been stuck to this section of the shop wall. Sadly the photo is in focus on the Mercury (obviously) and not very much in focus on the back ground. But we still can make out some of the photos, and it appears that some, perhaps all the photos were later reused in other parts of the shop. 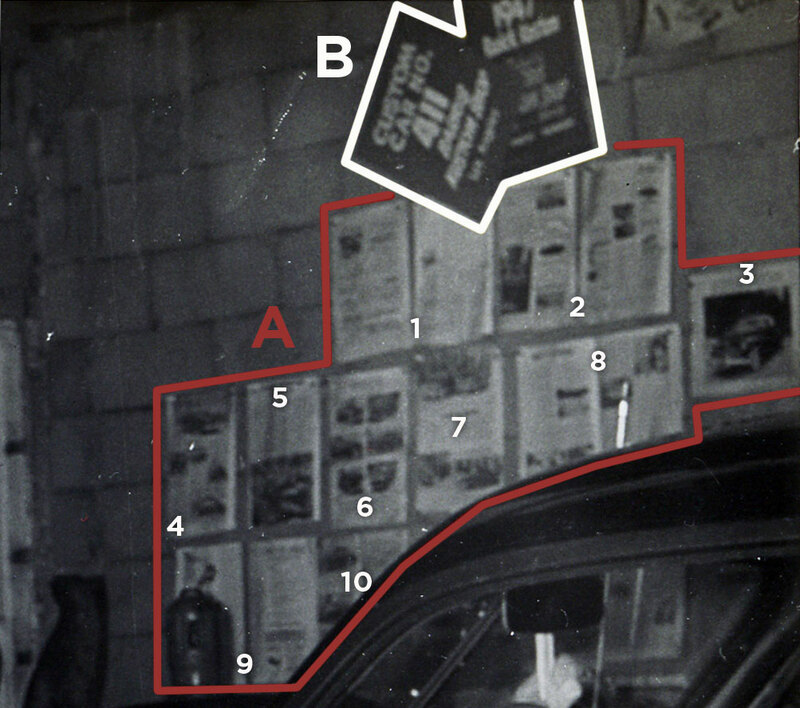 The photo also shows the door at the front of the shop, next to the oval window, and how the section of the wall on the right of the door was also used to display more magazine articles or photos of custom cars, or cars that might have inspired the guys at the shop. Hopefully one day we will be able to get some more sharper photos from this period as well. 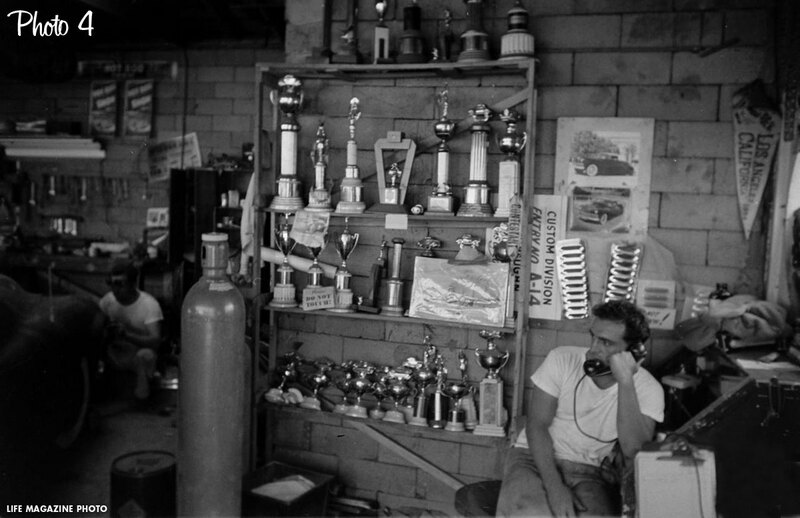 Photo taken in 1951, showing the front wall of the shop and the wall to which later the trophy shelf was put against. I have tried to identify as many things in the background of these photos as possible. But especially the photos and the magazine articles are either hard to see, or hard to identify. I do not have all the large page magazines from the late 1940’s and 1950-52. I do hope that there are more photos of this section of the Barris shop made in the early 1950’s and hopeully one day will be shared. If you do recognize more of the material on the shop wall’s that I missed, please Email Rik and let me know. I would love to add the info to this article.There are a few more photos from the early 1950’s showing this part of the Barris shop that I know about, but non really show anything more than the once used in this article. I visited the old Barris shop in 2011, and the building is still there. The current owner has a desk in the same spot as the Barris brothers had, only the small section next to the storage space is now turned into a small office with a new wall and door. The original window an door are still in the same location. Man Rik I don’t know if I if I should be impressed or worried that your obsession has really gone off the rails. 🙂 Very interesting post! Thanks Ian. No worries… I’m (still) rather sane… at least I like to think so. Just love to find out as much as I can about these old photos. Wow..I’m impressed. I love this sort of thing. Rik in your spare time could you try to track down a old girl friend of mine? L.O.L. Great bit of investigating Rik. You really take us back, Rik. How many times have we said, “If these wall could talk, what stories they would tell.” Well, you’ve proven they can. Great work! Thanks guys… glad you enjoy the detective/archeology work. I always get very passionate when I see these old photos with a lot of stuff going on in the back ground. Then I just want to know all the details about it. Hoping to do more of these articles in the future. My mate here in Brisbane has the Barris Glenn Campbell Lincoln. He visited George several years ago and there on the wall behind Georges desk was a pic of George, Glenn and the Lincoln.